The sea will no longer have secrets with the man’s watch in a limited edition from the Sealion collection. Firm and contemporary, with a sporty vocation but in the unique Philip Watch style, elegant for every circumstance. A model inspired by the fascinating underwater world and for those who love to explore it, the scuba divers. A fascinating world, full of mysteries, ready to reveal itself to those who are audacious enough to look into the eyes of the abyss. Scuba divers need special equipment to face such condition and watches also have exceptional characteristics. We have been inspired by the vintage model watches that they used to wear for this fantastic watch in a limited edition. A steel bracelet with dual shiny and glazed finish, a 42mm case and a one-directional rotating lunette are just some of the elements that can be found in this extraordinary time keeper. The sunray quadrant is blue, just like the colour of the ocean, in the same nuance as the lunette with luminescent indexes and hands. Sapphire glass completes the model. An audacious appearance that enhances the sporty vocation, reinterpreted in a Philip Watch key, with its unique elegance in every detail. But reference to the world of scuba divers cannot only be found in the look. There are many different functions dedicated to this mysterious universe: water resistance up to 300 metres in depth, a helium valve and extendable bracelet. A watch that transforms into personal equipment to be used in the depths of the sea abysses, but also in everyday life. The watch preserves the distinctive characteristics of every Philip Watch: a Swiss Made mechanism, reliable and accurate, clean and refined lines, reinterpreted by a 100% Italian design. 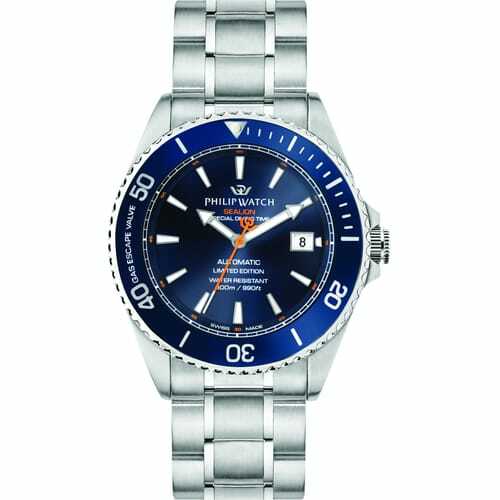 At the bottom of the sea or during a chaotic day in town, time is precious and must be scanned with an extraordinary watch: the king of the oceans for an overpowering spirit and a lover of freedom.